This is an amazing finger loop braid from the 14th Century! I had no idea anything like this had been made by European loop braiders (see note about kute-uchi braids*). See Poll Results re recent request for a video tutorial for this braid. I’ve put it on the list…. This dense, 10-loop cord is basically two square braids that are completely enmeshed and interlaced through each other down the axis of the braid. Each component braid keeps its own loops–the loops never migrate from one “sub-braid” to the other. 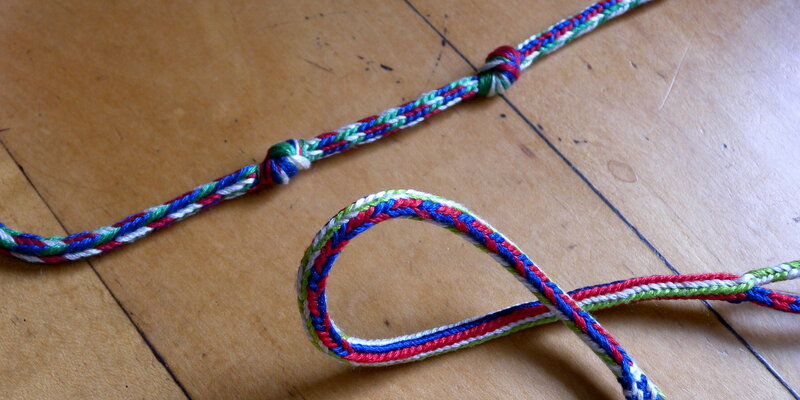 If you set up one with green and white loops, and the other with red and blue loops, you’ll get vertical bands of green/white and vertical bands of red/blue, but the two color groupings won’t mix together (making this another way to get lengthwise striping in a braid). Together the 2 enmeshed braids form one compact, larger, square or roundish braid with 8 ridges as compared to a regular square braid’s 4 ridges. The braid is very firm and solid. It’s nice as a bracelet–has a lot of body, doesn’t sag or drape. Another thing that’s nice about this braid is how different it looks from different angles. This is hard to convey in a photo. It’s great for a bracelet–the bracelet’s pattern seems to shift as your arm moves. I purposely twisted some of the braids in the picture above, to show them from different angles. This two-worker 14th C. braid is unlike any of the braids in the surviving braiding manuscripts from the 15th and 17th Centuries. 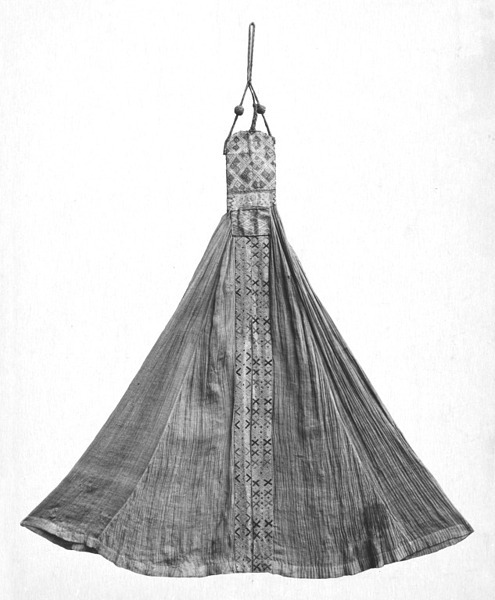 It’s only known from one artifact–an accessory to a small ecclesiastical textile called a sudarium or sudary, now in the Victoria and Albert Museum in London, but originally from the Cathedral of Halberstadt in Germany. Apparently a sudarium is the linen cloth that hangs from a “crozier”–the crook or cross at the top of a bishop’s ceremonial staff– for the bishop to wipe his hands on, presumably so he won’t get the staff dirty(?). Luckily, the braid somehow came to Noémi Speiser’s attention. Embroidered Sudarium, 1375~1399, Germany. This may be the one?, since it’s the right era. ©Victoria & Albert museum. No 3rd party reproductions (do not copy). You can find the photo here. This unusual braid, along with others that Joy Boutrup and Noemi Speiser have found in scattered museums and other collections, show that European loop braiding was already highly developed long before the earliest known loop braiding manuscripts (there are other examples of even older complex loop braids in Speiser and Boutrup’s 4-part series European Loop Braiding parts I-IV). I only just recently paid attention to Speiser’s description of this sudarium braid—it’s on pp. 66-67 of Old English Pattern Books for Loop Braiding. No photo, just a description, which I had glanced over but misunderstood until I really concentrated on it. After 3 attempts at this braid, I got the colors to work out the way Speiser described them. In the lower picture below, the knots are where I started over with a different arrangement of the same loops, trying to get the correct color-pattern. I finally succeed to the right of the rightmost knot–first the pattern Speiser describes on the Sudarium braid, and then the variation she suggests trying, where no transfers are turned (the stripey part). The directions made sense, but what with trying to adapt them to my own barely-figured-out solo-braider method for this braid, I kept getting the color-order wrong at first… I like those “mistake” patterns, actually! 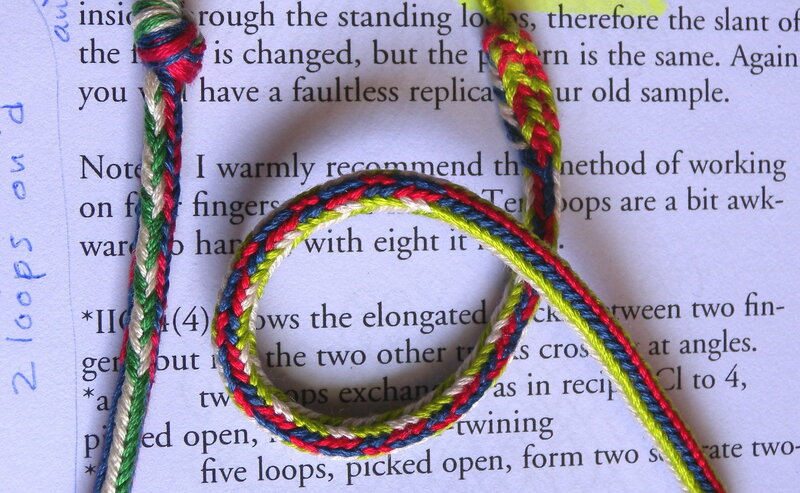 Speiser’s suggested 2-person method is very unusual: Two braiders work together, each making a standard 5-loop square braid, but not exchanging loops to connect their braids, as in most multiple-worker loop braids. Instead they take turns doing each braiding cycle through/ between the other braider’s outstretched loops. The way I picture it, the two braiders would have to stand (closely) next to each other, with their adjacent arms overlapped in some way, and take turns braiding. However, this is actually the alternative, easier method Speiser suggests for two braiders, not the one she thinks was actually used in the 14th C.
Each component square braid would be made by the left hand of one braider and the right hand of the other braider braiding together! Still with alternate cycles of each braid being done between the outstretched loops of the other braid. The braiders would probably stand the same way–adjacent arms overlapping. Both 2-braider methods would work to produce the braid, but the second way would require even more coordination between the two braiders. It would probably look like a strange partner dance with a lot of arm movements, or two people doing a silent “Miss Mary Mack” type clapping game while making Cats-Cradle string figures. Speiser suggests one method by which a solo braider could braid this Sudarium braid,*** which I’m sure would work, but I stuck with my basic braiding practice of using all my available fingers—including thumbs—before resorting to doubling or tripling loops on any fingers. A) because it usually makes for easier and faster braiding, and B) because it allows adding extra loops on some fingers later on, to make an even larger version of the braid. Another interesting thing about the Sudarium braid: Two surfaces of each component square braid are visible on the combined braid. These 2 surfaces are the ones that would have been the sides of the component square braids, if each one were a separate 5-loop square braid. (the ‘top’ and ‘bottom’ surfaces being the ones that would face to and away from the braider.) Actually, the top and bottom surfaces of the component square braids are also visible, but they are harder to notice. That’s because they are effectively split down the middle by the side surface of the other component braid. So they end up looking like a narrow border on the two edges of any side of the Sudarium braid. I like that the component braids’ side surfaces are emphasized, because it’s the side surfaces of a square braid that show those nice chevron shapes (in braids with single/mono-color loops, as opposed to bicolor loops)–I’ve always secretly considered them the ‘good’ sides of a square braid, compared to the upper and lower surfaces. This braid is the best example I have of the V-shaped chevrons that form on the sides of square braids. These chevrons are from 2 single-color loops in dark pink–the other 6 loops in this sub-braid are all bicolor loops of purple and light pink. 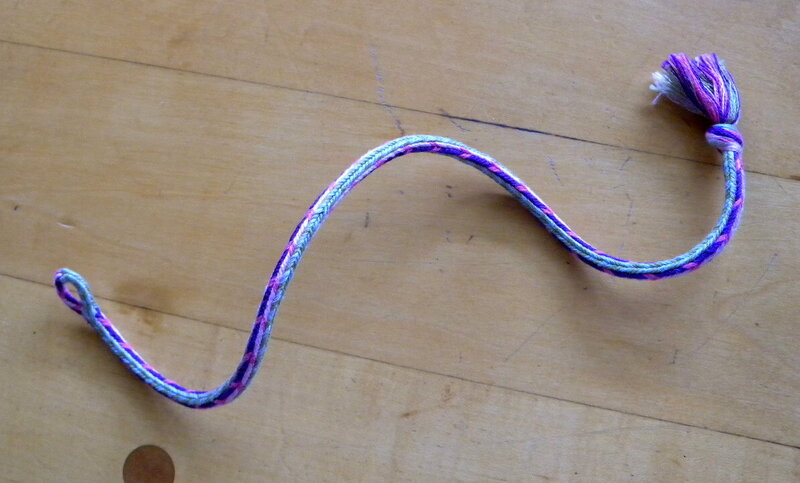 On the upper and lower surfaces of this component braid, the dark pink loops would have shown as “zigs,” rather than chevrons (split down the center in the photo below). The other sub-braid is of single-color loops in dull gold and dull silver—those chevrons tend to blend together. 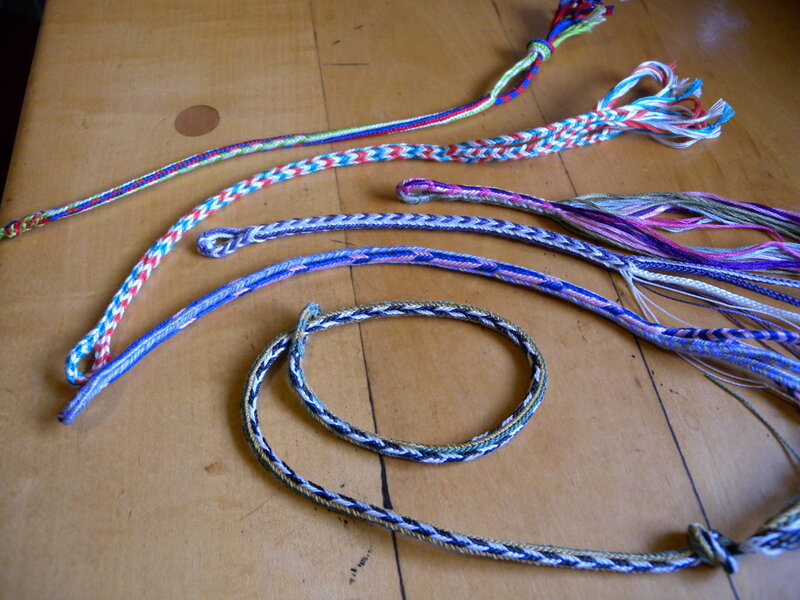 In the following braid, the two sub-braids would have chevrons on all 4 of their surfaces, not just the sides–that’s because each one started out with a color arrangement like that of the Medieval 8-loop braid called ‘lace dawns’. White and orange loops for one, and white and turquoise for the other. A short way into the braid I rearranged the loops so each component sub-braid had exactly the same colors: 2 turquoise, 2 white, 2 orange, and 2 white loops (in that order). If you look close, you can see the pattern change –a couple of inches below the loop start, on the lower right of the photo. The longer braid lying around it is of 12 loops of bonded nylon beading cord. 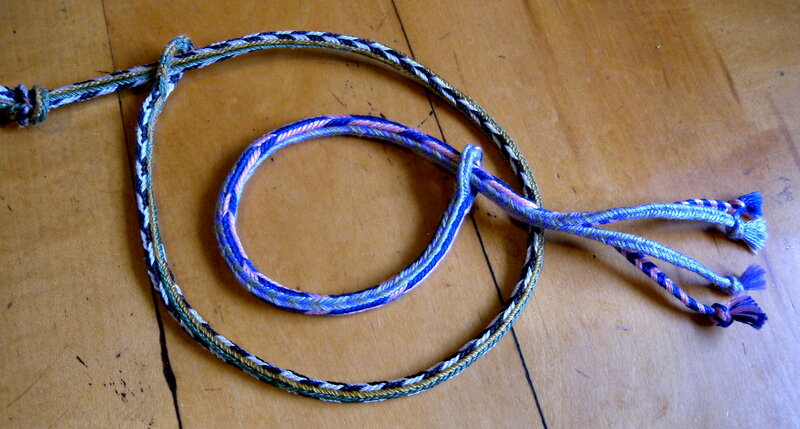 One of its sub-braids has black and white bicolor loops, the other sub-braid has gold and turquoise bicolor loops. Wow, a totally new braid! Thank you yet again to Noémi. Happily I am still nowhere near working my way through all the braids in OEPBforLB. P.S.—what I call a “surface” of the braid is a little misleading! They don’t exactly have simple sides or surfaces the way a tabletop is a surface. It’s the 4 ridges (corners) of a simple square braid that are its most basic units. Each “surface” is really a partial view of two adjacent ridges. Sudarium braids: I’ve been referring to this braid as “the Sudarium braid” as if it were the only braid associated with sudaries (sudaria? 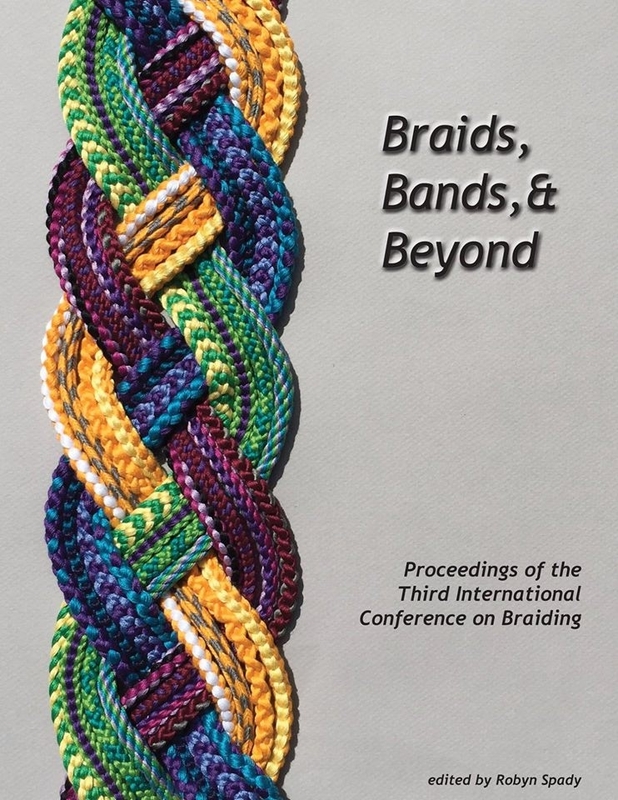 ), when in fact there is another very significant sudary braid artifact very different from this one that Noemi Speiser and Joy Boutrup have also analyzed – a lace-like openwork loop braid from the 15th C., probably made by four braiders working together. It is somewhat similar to the Catherine Wheele braid. In the long history of the Catholic church, there have probably been many other types of braids made to accompany sudaries, as well – so this was obviously not the best name to pick to refer to this particular and unusual braid! * There is a Japanese Kute-Uchi braid (hand-held loop braid) with a similar structure and appearance to this Sudarium braid. It is called Genji-uchi, and was traditionally made by a solo braider, not two braiders. I first came across it a year or so ago in a workshop taught by Kumihimo master Makiko Tada. Genji-uchi braids, 16-36 loops. Cotton, wool, linen. Makiko Tada originally learned kute-uchi loop braiding from Masako Kinoshita, the editor of LMBRIC, who in the 1990’s rediscovered the lost art of Kute-Uchi and proved that all the classic medieval and earlier “Kumihimo” braids—even the biggest and most elaborate ones that present-day kumihimo experts struggle to reproduce—had actually been made by loop braiding, not on any kind of braiding stand! *** Noémi Speiser’s one-person method incorporates a kute-uchi-style “outside-around” loop transfer that I’ve only seen once before with finger-held loops, on Phiala’s String Page. Phiala (aka Sarah Goslee) uses an outside-around move with fingerloop braiding as part of her single-braider method for braiding “the 2 person version of the round lace” (I call this a 10-loop double braid), using 8 fingers, no thumbs. Her site has a lot of great info about various archaic textile techniques, including braiding, and also now an online store for supplies. **** Re 12- and 16-loop versions: In making Sudarium braids, I eventually discovered that using an even number of loops for the sub-braids results in a more balanced-looking and symmetrical braid. Because of that I’ve been making more 12 and 16-loop versions than 10 and 14-loop versions. This is not in general true for even-no.-of-loop braids, in fact usually the opposite is true. It’s the exact same reason that the more well-known braid called Barleycorn or Grene Dorg is made with an even number of loops. 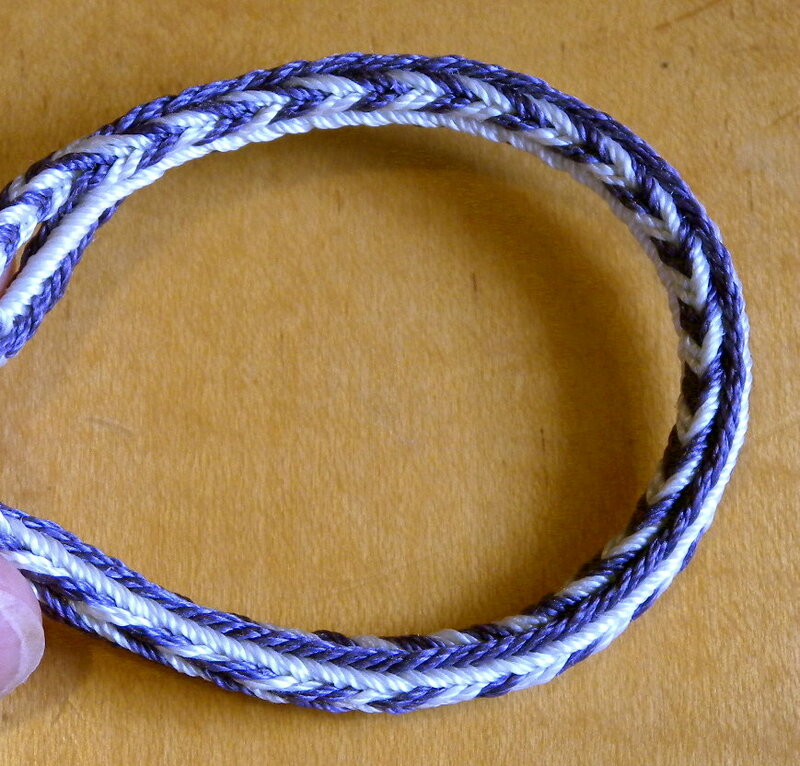 Barleycorn comprises an underlying 4-loop square braid (navy blue in the photo above), plus 2 contrast-color loops that twine down the center of the braid. If 5 loops instead of 4 are used for the square braid (navy) portion of the braid, the contrast-color twined threads end up off-center, rather than in the exact middle of the braid. That is, the blue border in my example above would be wider on one edge than on the other if I had used five blue loops rather than four. (I’ve tested this, and it’s very clear in the resulting braid.) For the contrast-color twined area to end up in the exact center of the braid, both the right and left hand have to be holding the same number of background-color (square braid) loops when the twining moves occur in the middle. That’s only possible with an even number of loops. This is counter to the most common way to make square braids. An odd number of loops is much more common, and on its own, this actually produces a more symmetrical square braid than if an even number of loops is used. The Wayuu people in the Guajira penninsula of Columbia have a very developed fingerloop braiding tradition, which includes a braid very much like Barleycorn, also with an even number of loops — two more than the European version. Their underlying square braid has 6 loops rather than 4. See the photo of braid #12 (Kulenaki’iya – Bridle) in Masako Kinoshita’s report on Guajira braiding in LMBRIC. The Sudarium braid is a similar case, since each of the two square sub-braids essentially divides the other sub-braid. This is easiest to understand if you watch two braiders making this braid together. One braider waits with outstretched hands, while the other braider makes two braiding moves between the waiting braider’s outstretched loops. Then the waiting braider takes a turn to braid between the other braider’s outstretched loops. If the waiting braider consistently holds three loops on one hand and only two loops on the other hand while the active braider braids between them, then one edge of the braid will end up being wider than the other edge. However, all the edges will be about equal if each braider starts and ends her two braiding moves with the same number of loops on each hand. This can only happen if both braiders hold an even number of loops. So the total number of loops should ideally be a multiple of four for the most symmetrical result, not just a multiple of two. This really makes me wonder why this “sudarium” braid Speiser found was made with ten loops rather than twelve! Twelve loops is not a difficult number at all for a two-person team to handle. Even before I understood the reason for it, my own trial-and-error with this braid showed pretty quickly that a 12-loop version has more symmetrical color patterns than a 10-loop version. Since there’s only one known surviving example of this braid we can’t know if it was a typical representative – personally I would guess that 12-loop versions might have been more common than 10-loop ones. ← You CAN put your loops down! Hello. Have you ever heard of the Caddis Man? He was supposed to sell his wares of braids and worsted tapes in Tudor times. Sorry Am., I have not heard of him. Well, this is 4 years later, so I don’t know how useful it is! But I just came across a reference to caddiss or caddis ribbon or tape. If you google “caddis ribbon” you’ll get several references, including Shakespeare. 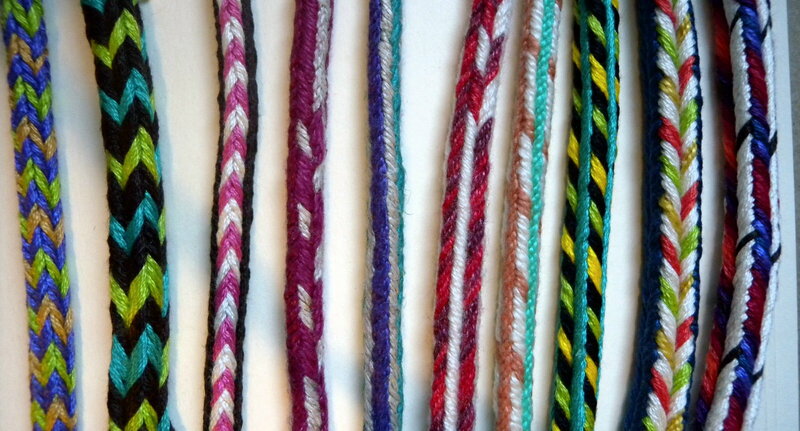 I almost always start braids with a loop, but there are a few different ways to do this. The easiest way does leave a tassel of ends (as in most of my square braid tutorials)–you just start your braid with a divided section (all loop transfers straight/ unturned/ unreversed). Or you can end your braid that way. Sorry to bother ou so much…whre can I find how to create the braided ‘eyelet’ on the sudarium? I could see this being very useful to create a buttonhole on a cuff, with a monkey’s fist knot on the opposite end as a button.